The Bodiford Home was purchased by the City of Powder Springs in 2014. It is a two story Queen Anne home with designs of the late 19th century. The original core of the home dates back to the 1800’s. It is now renovated and converted to the Seven Springs Museum. The dedication and grand opening was October 11, 2015. 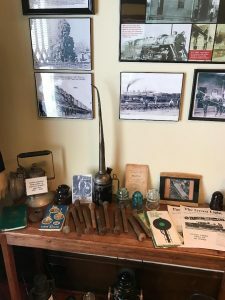 One of our front rooms is dedicated to a collection of Indian artifacts and Civil War relics that were found in the Powder Springs area. During the Civil War Atlanta Campaign, there were no major battles in Powder Springs, only skirmishes. The Baptist and Methodist churches were torn down and the lumber used to build winter quarters. Both churches rebuilt on the sites where they stand today. There was at one time as many as 16 Civil War generals in Powder Springs. The kitchen area has items used by the pioneers of Powder Springs, including a Colonial cast iron stove and cookware. Of special interest is a fireless cooker used to cook meals by heating soapstone. 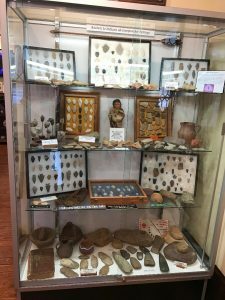 The main entrance to the museum contains a brief history of Powder Springs from the time that the Creek & Cherokee Indians occupied the area. The settlers came as early as 1819. The railroad was a very important part of the development of Powder Springs. What is now the Norfolk Southern Railroad was built in 1882. This is the railroad next to the old museum. The Seaboard Railroad was built in 1905. This is now the Silver Comet Trail. There is a display of items from the Coats & Clark Thread Mill that came to the area in 1931. This gave the economy a boost after the boll weevil devastated the farming community. 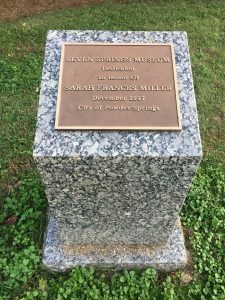 There is also an area devoted to the founder of the museum, Miss Sarah Frances Miller (1918-2002). One gallery contains several items dating back to the mid-to-late 1800’s. We also have displayed an award winning oral history of the Black Community in Powder Springs developed by the students of the West Georgia College. Displayed in the Carriage House is farm equipment used by the farming community in the late 19th and early 20th centuries. The buggy was used to carry mail to the rural community by Mr. Dave Miller. Attention genealogy enthusiasts!We’ve started a free Genealogy Group here at the museum. It meets on the last Thursday of each month at 6:00 PM. Everyone is welcome to join! If you have any questions, please contact us. Thank you!